Prep the noodles. 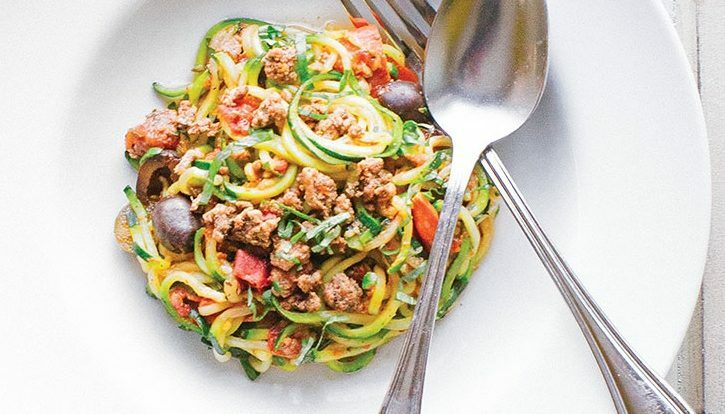 Julienne the zucchini with a spiralizer. Place the noodles in a colander and toss them with the salt until the strands are lightly coated. Set the colander in the sink to drain while you prep the other ingredients. Cook the meat toppings. Heat a large, nonstick skillet over medium-high heat. Crumble the pork and beef into the skillet and cook, breaking up the meat with a wooden spoon. While it cooks, combine the salt, parsley, Italian herbs, pepper, garlic powder, paprika, fennel seeds, and red pepper flakes in a small bowl. When the meat begins to lose its pinkness, add the seasonings and mix to combine. Cut the pepperoni slices in half. When the meat is browned and sizzling, add the pepperoni and stir-fry until slightly crisp. Transfer the meats to a large bowl. Make the sauce. In the same pan you used for the meat, heat the olive oil over medium-high heat. While it heats, peel and crush the garlic. Add the garlic to the pan, and when it’s fragrant, after about 30 seconds, pour in the tomatoes. In a small bowl, mix together the oregano, basil, parsley, salt, garlic powder, onion powder, and red pepper flakes; stir with a fork and add the spices to the pan. Stir to combine, bring the sauce to a boil, and then reduce the heat to low. Beat the eggs in a small bowl, add a spoonful of the tomato sauce to the eggs and stir to combine, then slowly pour the egg mixture into the tomato sauce, stirring constantly to combine. The sauce should thicken slightly and get silky. Keep the heat on a very low simmer. Cook the noodles. Heat a second large, nonstick skillet over medium-high heat. 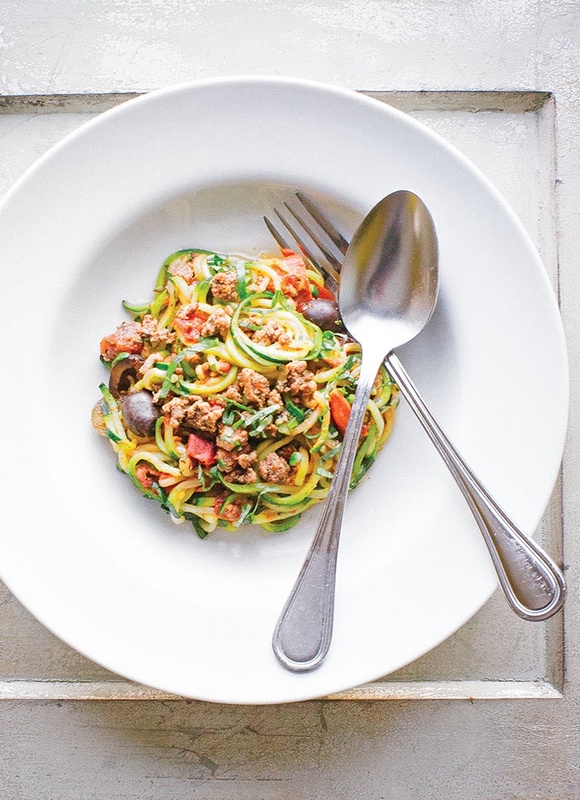 Rinse the zucchini noodles under running water, drain, and squeeze dry in a clean dish towel. Add the noodles to the heated pan and stir-fry, 2–3 minutes until hot. Add the meat, olives, and jalapeño slices; toss to combine. Use a ladle to add tomato sauce to the noodles, stirring to combine after each addition so it doesn’t get soupy. Add the fresh basil and stir. To serve, divide the noodles among flat bowls, then sprinkle each with crushed red pepper flakes and a drizzle of olive oil.